The actions your company takes to resolve issues are much more important than the words you say. Ideally, solving a customer’s problem is a three-step activity. First, you tell them what you’re going to do. Second, you do it. Third, you follow up to ensure they are satisfied. It’s really that simple if processes and procedures don’t get in the way. And that’s the main problem. Companies have processes and procedures that are designed to provide consistent service in an efficient manner. When they work well, customers and the company reap benefits. If they fail, everyone loses. Failure is usually caused when the people charged with implementation don’t understand what they need to do or don’t have the authority to do it. 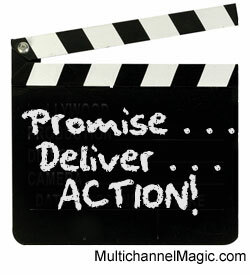 Having a no service policy is better than making a promise and not delivering. People expect what you tell them to expect. If you have a no service policy, your customers don’t expect service. If you promise the best service, your customers expect white glove treatment. Managing expectations is the first step to delivering quality service and customer satisfaction. Keeping customers happy is not as difficult as some companies make it. The fear of massive expenses and fraudulent activity drive management to make stringent policies that hurt satisfaction without delivering many benefits. Designing policies to benefit customers and addressing fraudulent activity on a case-by-case basis is a better practice. Perform an effort audit. How many times do customers have to contact your company to resolve an issue? Do you provide online options for resolving issues? How long does it take from first notification to final resolution? How much time do customers have to invest when they have a problem? Answering these questions and more will help you identify needless effort areas so you cannot eliminate them. Provide online self-service options. Your customers don’t want a relationship. They want products and service that makes their lives easier. Providing opportunities for them to resolve their issues improves satisfaction and reduces costs. It is an effective and inexpensive win-win solution. Make contacting the right department easy. Making it hard to get in touch with someone who can resolve an issue doesn’t reduce costs. It increases frustration. Placing contact information on every webpage and outgoing direct mail piece increases trust without increasing calls or emails. Your customers are busy people. They do not want to contact you unless they have a problem. Don’t make promises you cannot keep. If your infrastructure isn’t designed to resolve problems quickly and effectively, fix it before making top-quality claims. Loyal customers will see your efforts as a commitment to keeping their business. Lost customers can be wooed back once the changes are complete. If you cannot keep your promises, apologize and explain. Things happen. Most people understand that and accept reasonable explanations when accompanied by a profuse apology. The most powerful words in customer service are, “what do you want us to do?” In most cases, the requested resolution is less than you would’ve offered. For a review of your customer service, email Debra at dellis@wilsonellisconsulting.com.